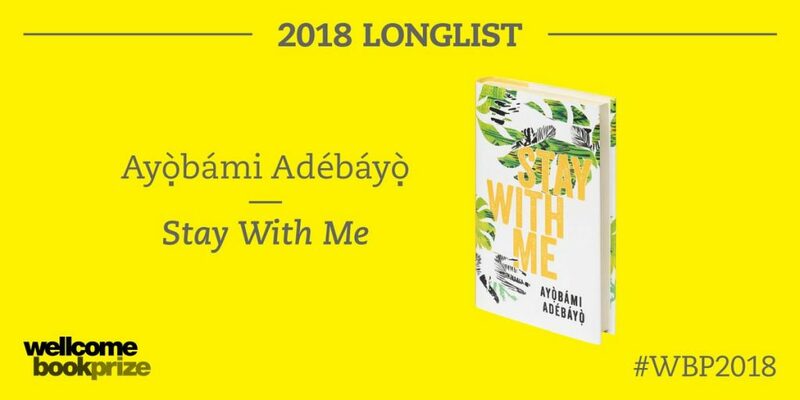 We are delighted to hear that Ayòbámi Adébáyò’s Stay With Me has been long listed for the Wellcome Book Prize 2018. The longlist of twelve titles was selected by a judging panel chaired by Edmund de Waal with Dr Hannah Critchlow, Bryony Gordon, Sumit Paul-Choudhury and Sophie Ratcliffe. Authors from the UK, Ireland, USA, Nigeria and Canada are in contention alongside the first Swedish (Sigrid Rausing) and South Korean (Han Kang) authors to be longlisted for the £30,000 prize. The shortlist for the prize will be announced on 20 March, with the winner revealed at an evening ceremony on 30 April at the Wellcome Collection. Previous winners of the Prize include Maylis de Kerangal (author) and Jessica Moore (translator) for Mend the Living in 2017, Suzanne O’Sullivan for It’s All in Your Head in 2016, Marion Coutts for The Iceberg in 2015, Andrew Solomon for Far from the Tree in 2014, Thomas Wright for Circulation in 2012, Alice LaPlante for Turn of Mind in 2011, Rebecca Skloot for The Immortal Life of Henrietta Lacks in 2010 and Andrea Gillies for Keeper: Living with Nancy – a journey into Alzheimer’s in 2009.